It was during the World War II when DeWitt Clinton Peters arrived in Haiti as a high school English teacher. He chose teaching to substitute service in the military. Peters had a natural passion for art and especially painting but was surprised to find that there were no art galleries in Haiti. Peters picked a dream to preach art in Haiti. 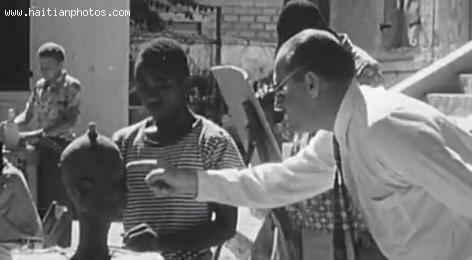 He committed himself to convince Haitians that art was a noble profession. He told the people of Haiti that they could make a better living through embracing art. Because of his influence DeWitt Clinton Peters remains a renowned figure in the Haitian art industry. During his early days in Haiti he developed a dream to establish an institution which would train and encourage talented citizens. He was out to convince citizens that art was more paying than other common careers like sweeping yards or driving taxis. One of his dreams came alive when the Haitian government donated a building to peters for use as an art centre. The Le Centre d'Art was commissioned in 1944. Peters had to resign from teaching so as to give full attention to art. The art centre was used as both an art training centre as well as an art gallery. Interested Haitians received guidance and instructions in drawing and oil techniques. Art products could also be displayed in the art gallery. The centre has exposed a lot of artistic talent that has grown to make an historical art movement in Haiti. Through DeWitt Clinton Peters and the art centre, Haiti has seen generations of passionate artists. The first generation was self taught and produced original primitive pieces of art. For instance, Hyppolite is one of the first products of the art centre. The mysterious Voodoo priest is known for his primitive paintings done using chicken feathers together with leftover house paint. From small pictures to immovable wall paintings and murals Haitian art has evolved to attract world attention. Haitian art has now attained world recognition and is the best in the Caribbean. What ever happened to the Peanut Donation to Haiti?